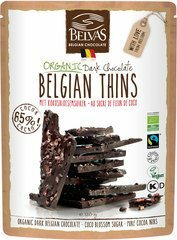 Treat yourself - or another - with these belgian thins. This broken chocolate is made of 85% dark chocolate and sweetened with coconut blossom sugar and pieces of pure cocoa. The cocoa for these thins comes from Peru and is Fairtrade certified.